The kangaroos have finally made their impact on this crucial Perth test. They are just 5 wickets away from attaining a must needed win in order to fight to attain the Ashes. England at the close of day were tottering at 81 for 5, with Collingwood out at the last ball before stumps.This would act as a great anchor for the Aussies in regaining their confidence and also feeling back to life. Australia who were in some wobbly position at the start of the day 3.After resuming the innings from 119/3 Watson and the in-form Hussey were at the crease. They once again lost early wickets, with Ponting continuing his horrible string of form.But here a crucial innings were built up, Hussey and Watson put up a stand of 113 runs. Watson was first to leave the crease with just five short of his century and caught leg before by Tremlett.Next with Smith on the crease, along with Hussey were able to host an another important half century partnership, finally Smith dismissed at 36. 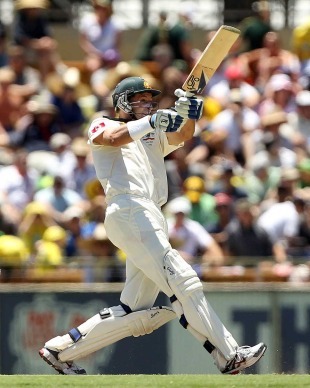 After that wickets kept on tumbling , but Hussey managed to secure his century, and finally the innings ended at 309.Hussey being the last to depart at 116. Hussey played some amazing pull shots through out the day, and was bowlers nightmare whenever they gave anything short to him,The star performer for England was Tremlett , who managed to get a five wicket haul trying to make the impact worth it. But the damage had been done till then. With 391 to win, England were never in a position to stay put on their position. They kept on losing wickets from the start, no one even looking to post any serious threat to the Aussie bowlers. The inform Cook was dismissed for 13 trapped between legs from the bowling of Harris, becoming the first causality at 23. With Strauss and Pietersen cheaply dismissed, England were losing all their chances to be in the game. Trott and Collingwood on crease were trying to make some impact with Trott, imposing himself on the Aussie bowler failed to make any kind of impact. So the bowlers did what they had to.Trott so for being the highest scorer got dismissed at 33. The final blow was that of Collingwood who got dismissed at the last ball of the day, leaving Anderson to wait for his partner till the morning.Now what the Aussies would be waiting for would be do wrap up the innings as soon as they can , and can celebrate.